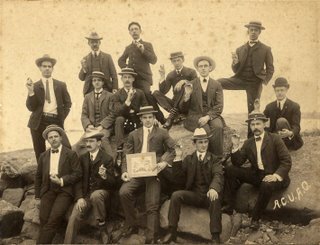 The photo to the right is of a group of men holding coins. 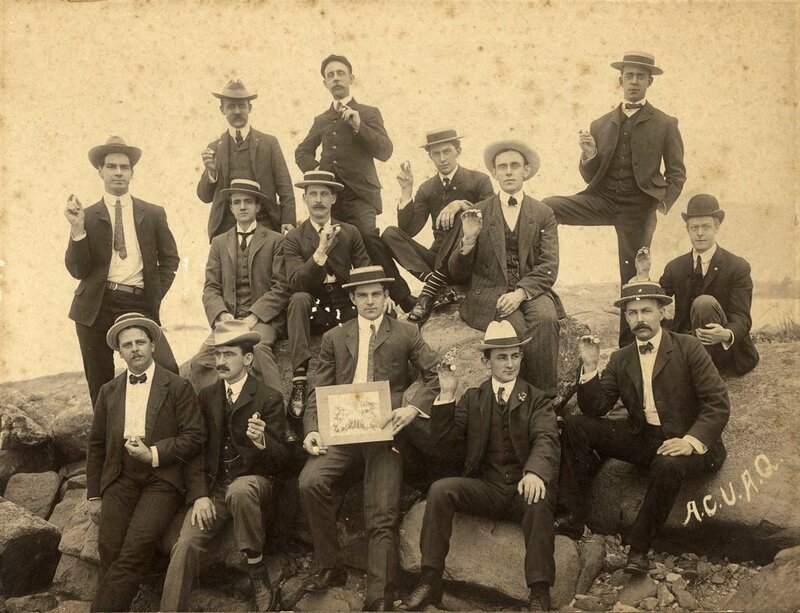 One man is holding a photo which appears to be of another group of men - possibly holding coins. They are seated or standing on rocks probably somewhere along the coast in Salem, MA. I believe the photo was taken about the turn of the century 1900 - give or take a decade. The men are all wearing hats, suits & ties. In the middle row, third from the left sporting a mustache and looking off to his right is my great-grandfather: Stephen Henry Simon(s). I've been puzzled by this photo and the incription at the bottom right: "A.C.U.A.Q." Who are these men? Besides my great-grandfater, I have no idea. Some strange Salem cult? I doubt it. Possibly a group of business men? 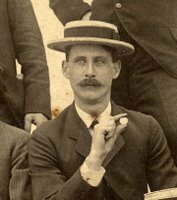 Stephen, "Henry", owned a confectionary in Salem, passed down from his father Stephen Augustus Simon, and his father John Simon. John started the business in 1807; Henry took over in 1908; converted it to a bakery due to a shortage of sugar during World War I; and closed it in 1925. A visit to my great aunts Ruth and Anna this afternoon, taught me what that little inscription stood for: "All Cough Up A Quarter." I have a simialr photo of the group w/o suit jackets & holding hats. The location is Winter Island in Salem and this is written on mine. My grandfather WE Hoyt is in mine and probably yours. I think he is sitting on the rock. Mine is dated July 27th, 1902.